Product prices and availability are accurate as of 2019-04-23 13:59:49 UTC and are subject to change. Any price and availability information displayed on http://www.amazon.com/ at the time of purchase will apply to the purchase of this product. Nature's Way Choline and Inositol 250 mg/250 mg - 100 Capsules Nature's Way Choline and Inositol is bound to tartaric acid to improve absorption. 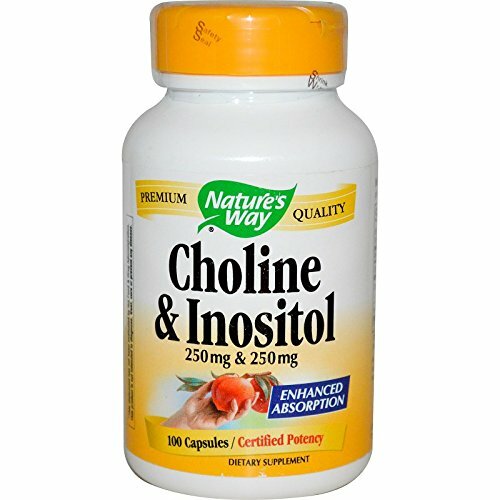 Nature's Way Choline and Inositol is an essential precursor of acetylcholine, a stimulatory neurotransmitter. Nature's Way Choline and Inositol also helps in the production of lipotropic agents which converts fats into useful products and aids in the production of HDL cholesterol. Nature's Way Choline and Inositol helps maintain cellular efficiency. About Nature's WayAmerica's leader in herbal medicine. If you've heard of Nature's Way, or better yet, used their products, it's not surprising. They have been America's leader in herbal medicine for over 40 years. As the pre-eminent provider of health and healing through the power of nature, their commitment to quality reflects their commitment to you. In fact, it's woven into the very story of their founding. A family crisis and an herbal renaissance Nature's Way originated from a circumstance everyone can understanda family's desperate need to overcome a personal health crisis. Back in the late 1960s, Tom Murdock, the founder of what is now Nature's Way, needed a solution to help his gravely ill wife. After trying conventional medicine without success, Tom and his wife turned to the traditional Native American knowledge of "medicinal plants" growing in the Arizona desert. As a result, she recovered and lived an additional 25 years. Tom Murdock's pioneering spirit did more than save a lifeit led to the renaissance of herbal medicine in America. As word spread about his wife's recovery, Tom set out to find other healthy treasures growing in the Arizona desert. By 1969, Tom and his family had eight new herbal remedies to share with others and thus began the legacy of Nature's Way. While it may seem hard to believe now, for many years herbal knowledge was a lost art in a country fueled by conventional, and often invasive, medical approaches.